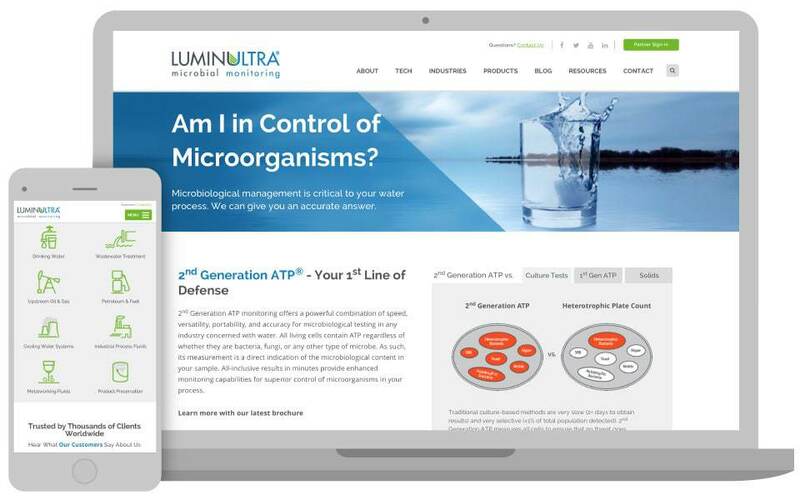 LuminUltra is a biotech company based in Fredericton, New Brunswick, Canada that strives to teach the public about the risks of microorganisms in water systems. LuminUltra provides fast and simple solutions to mitigate these health risks in water. LuminUltra’s previous website did not reflect their message of “if you do not measure it, you cannot control it.” The site made it difficult to manage content and integrate inbound marketing solutions. LuminUltra’s market has expanded to the USA and globally, and the company wanted a website that would reflect the look, feel, messaging and interaction of a progressive international biotech company. A new responsive website was created for LuminUltra to better meet their vision and goals. Current photos, graphics and colors were used to reflect a more modern look and feel. New interactive features were implemented such as a custom industry solution finder and a custom login system. Pardot was integrated into the site and allows the client to easily manage their gated content and inbound leads programs. The client requested an accelerated timeline for this project, which was met with success by the 3 Media Web team.